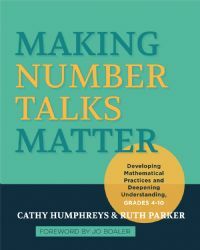 Number Talks is now updated with Common Core connections. You'll find the same great content, only now video segments are highlighted throughout to illustrate how Number Talks provide a vehicle for students to develop and utilize specific Standards for Mathematical Content. Video segments are also highlighted throughout to illustrate how Number Talks support students in developing the Mathematical Practices. While the book may be used as an independent resource, it is also structured to provide a framework for collaborative learning groups or to provide professional development opportunities through grade-level teams, individual schools, or districts. Chapter 9 serves as a facilitator's resource, providing guidance for use of the video clips by grade level along with discussion questions to support reflection and collegial conversations about number talks and students' learning. The accompanying DVD provides a visual platform for teachers to reflect on their current practices and target essential understandings from their readings. The DVD features nineteen number talks filmed in actual classrooms, plus seven bonus tracks highlighting interviews with the author and teachers. Clips range from five to ten minutes in length with a total viewing time of approximately two hours.